After a rather luxurious evening at the Chateau it was now time for the serious business of the trip. We awoke early and prepared to leave for the base point of the ascent. The first shock was the ice on the windshields of the cars. After delaying an hour we had breakfast and then about 8:00 went to the Park Ranger office to check on the best path to the top. We received non-commital, vague references to the terrain. However, by this time the temperature had climbed a bit, the frost was gone and the sun was shining brightly in the northern sky. Looking north we had a view of the beautifully symmetrical cone ofNgauruhoe , welcoming us and encouraging our climb. 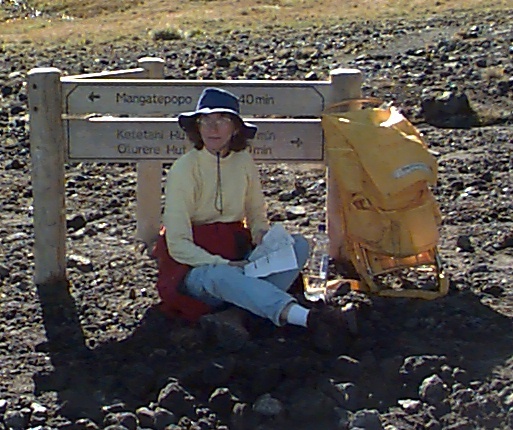 To start our ascent we left Whatapapa, driving a few kilometers west to the highway, then a few kilometers north and then about six kilometers east to the parking lot where we would leave the car and approach the volcano by foot along a well marked path. We were not the only people to be out there this morning. 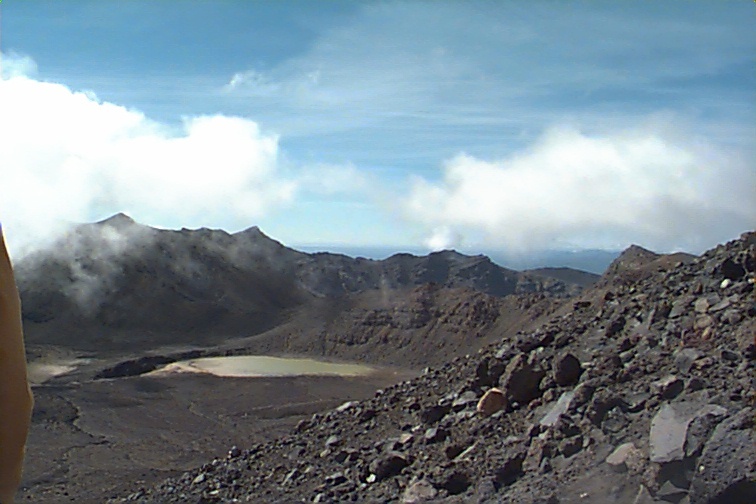 The parking lot is the access point for both the ascent on Ngauruhoe and the Tongariro crossing, which is billed as the finest one day walk in New Zealand. We started out about 9:00 a.m. There were groups of 2 and 4 people heading out from the parking area, spaced about 100 meters apart. We would not be alone in the wilderness! It also imposed a certain pace on us as we kept our relative position. While this pace was brisk we managed to maintain it without too much trouble. However, every now and then a very fit tramper or two would come breezing through. Our fellow trampers are all courteous and invariably greet you with a smile and a greeting. Often this is spoken not with a New Zealand accent but rather with a European one -- commonly Germanic. The parking lot is located at an elevation of about 800 meters. The peak of Ngaurohoe is 2287 meters. We were faced with a vertical climb of about 1.4 km (about 1 mile). The first part of the ascent, this beautiful, sunny morning was really a fairly comfortable stroll. A broad path had been created through the scrub which led upwards along the Mangatepopo stream towards a set of falls called the Soda Springs. This is a distance along the ground of about 3 km with a rise of perhaps 100 m or so. Along this path there is one short area of climb (perhaps 10 meters) with a little set of rapids where I looked back, pleased with our progress. It took about an hour to reach the Soda Springs area where we took a short break. It was just before this point that Christine and I stood by the side of the track while a fast paced woman came striding by. 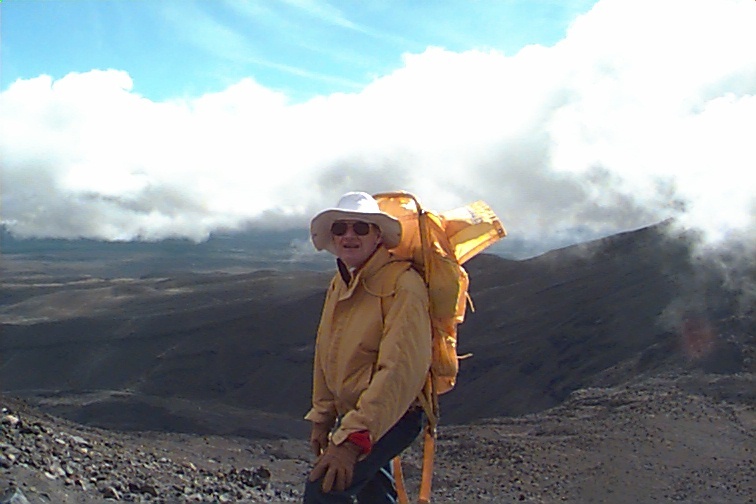 We were looking up at Ngauruhoe, very close to the base, wondering what the best approach was. She asked "Are you going up there?" and we replied that we hoped to and were wondering which was the best approach. She pointed to the saddle and said "just up there, along the addle, and up" followed by the Kiwi catchall phrase "not a problem". Then she strode off. She looked to be in her 60's and strode away at a fast pace as if she did the ascent every morning -- before coffee. Our eyes and later our feet followed her directions. The first step after the Soda Springs area was the route up to the saddle. 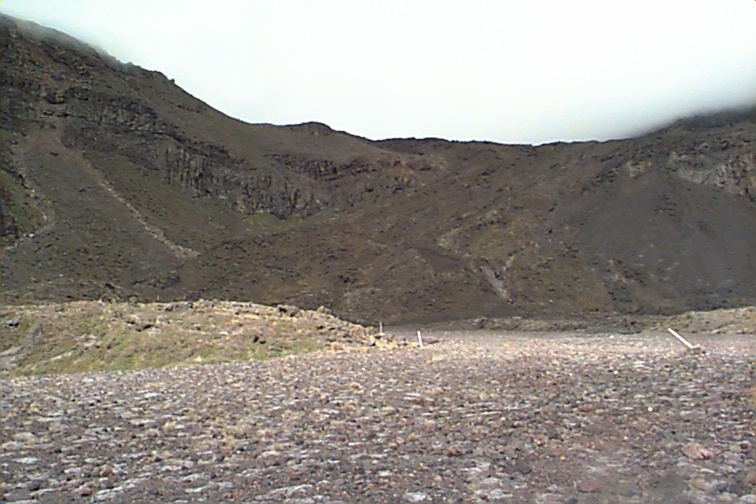 In the photograph the route is marked by a series of white stakes which wind their way up the escarpment just to the right of the slide area. The route up was almost vertical resembling a very steep staircase, where the 'stairs' were rocks of varying size. It would be a difficult climb for anyone. Fortunately I had a 40 pound pack that I was carrying (Christine was concerned that we should have adequate supplies for several days) to add to the sport. Then half way up I had an alergy attack and it took a few minutes to recover and to be able to climb again. While the climb looks small in the photograph it is actually about 100 meters high. It took us a while to reach its top which was the saddle we were aiming for as the start point for the ascent of the cone of Ngauruhoe. 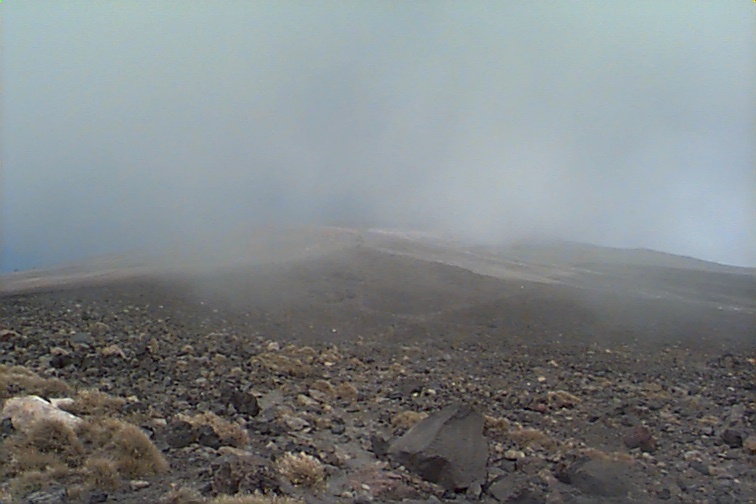 As we neared the saddle the wind started to blow and clouds started to move towards the mountains from the east. It was a cool breeze, so after a brief stop during which we put on more clothing (the pack got lighter) we started our ascent of the cone. From here we had about 1000 meters to climb to complete our ascent. It was now just after 11. 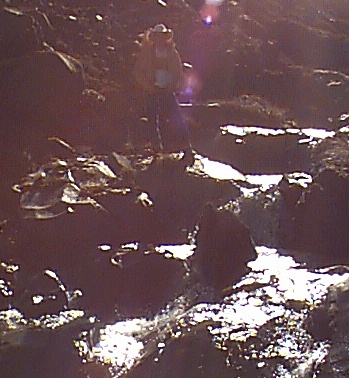 In the past hour we had climbed from the Soda Springs to the saddle. The initial part of the ascent was a walk of about 250 meters along the saddle which gently merged to the slope of the cone. The terrain was easy to walk on . although it was covered in boulders of varying size. It only took a few minutes to cross this area and start the climb. The wind continued and it gradually got colder. The incoming clouds created a dampness which made the cool wind even more chilling. Another hundred meters or so upward and we stopped in the clouds beside one of the poles marking the general ascent route. In the lower right of the photograph a lake is just visible through the clouds. 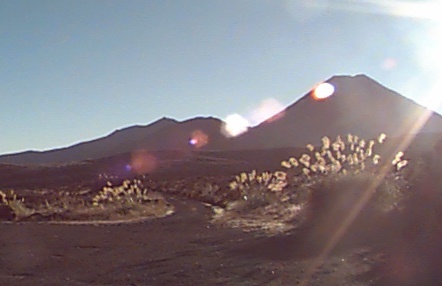 It is located at the altitude of the saddle which gives some idea of the vertical distance we have come to this point. Turning and looking uphill the cone of Ngauruhoe has disappeared in the clouded mists. At this point we are still within the vegetation area although above the tree line. In spite of the cold wind and the mists we continued our ascent, hoping that the winds would die down and that clouds would clear. And for awhile we were lucky. The wind did not die but the clouds did clear a bit and we were able to see the valley below us on the east. Note the sweater and gloves on the frozen climber who has now climbed above the vegetation level on the slope. The flat area immediately behind is the level area where the soda springs were located and where we had been a short time before. We continued our climb. The terrain was now a mixture of rocks of different sized sitting on a matting of volcanic dust. All the rocks were loose so that you needed to be aware of other climbers and what they were causing to roll down. That's right, we were not the only ones trying to make this ascent. 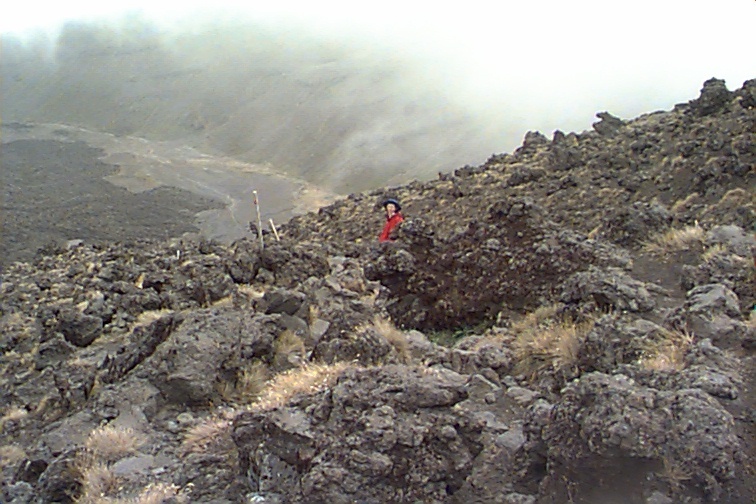 But now we started to notice that some people were abandoning their climb and heading back down. But we continued on for a while, following still the marker posts. These ended at a final ridge just before a slope of red scoria which led to the top. We sat here for a while looking down at the lake far below on the level of the saddle. 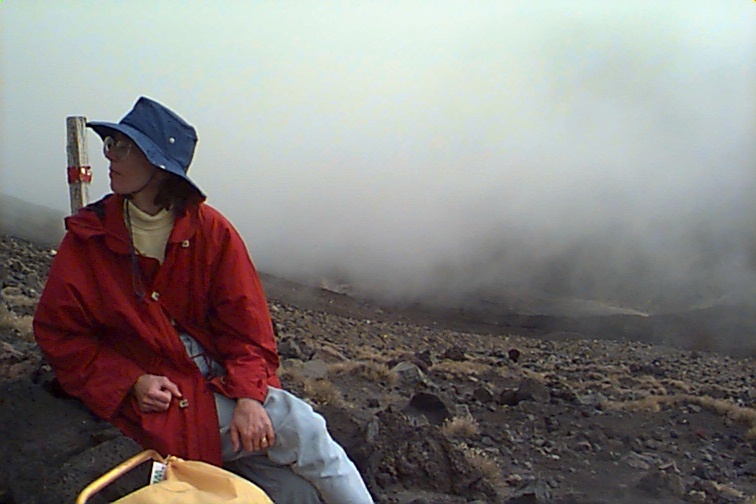 We were above the rim of the Red Crater which is at a hieght of 1886 meters. It was cold. Although the sun was breaking through, the upper reaches were still enshrouded in cloud. We had to admit that we were not meant to make this day. The Gods had decided that we were unwelcome intruders. We would have to depart. And we did. The climb down was, surprisingly, not a lot easier than the climb up. Christine however, without a pack, was able to make good time and was soon back in vegetation zone, still high above the lake in the saddle area. The rest of the descent was uneventful. As we moved off the saddle and onto the level of the Soda Springs, warmth returned and we were able to remove gloves and sweaters. We were now walking on a gentle downward slope and eventually reached the carpark. It was ten to three. Our mana (mana==prestige, power) had been depleted. I vow that we will return to recover it (but not before spring!). Two thoughts occurred to me as we descended. I realized that the "Not a problem" lady had not passed us on the way down -- was she still up there? Or, had I been to exhausted to notice? Also I wonder about all these 60 - 70 year olds that go past me at such a pace. Are they really just prematurely aged 35 year olds?